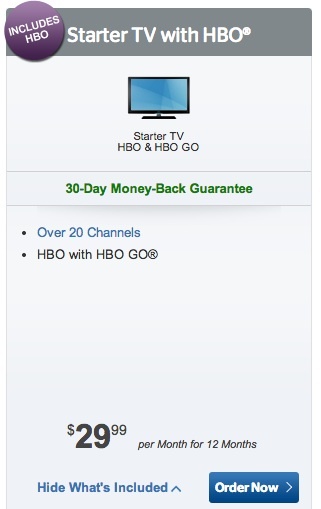 Time Warner Cable(s twc) (TWC) is experimenting with cheaper bundles to keep people from cancelling cable: The pay TV provider just introduced a Starter TV with HBO bundle that includes access to 20 channels, including local broadcasters in HD, as well as HBO and HBO Go, for $30 a month (hat tip to Lightreading). TWC is the second cable company to experiment with this kind of cheap bundle after Comcast started offering a similar bundle in October. As with the Comcast(s cmcsa) bundle, it’s worth noting that the actual price on a consumer’s monthly bill won’t be $30. In order to actually watch any of these local channels, consumers still need to rent a cable box, which currently costs $10 a month. Add various fees and taxes, and you’ll more likely end up with a monthly bill of around $45 to $50 — and that doesn’t even include internet access or a DVR. In the end, the Starter TV package is not that different from any other deal meant to upsell other services. But the way this package is marketed still tells us something about the offers consumers ask for, and the pressure pay TV providers feel to respond. There’s a demand for fewer channels and smaller bundles, and consumers are less willing to buy into huge packages just to get that one premium cable network they’re going to watch. No, Time Warner Cable Offers are about as cheap as a box of horse droppings. I just looked this up through my account and it’s the real deal. I’d definitely consider it if they allowed you to watch the channels through the TWC TV app. But since there is no way I’m ever putting a cable box under my TV again, this is basically just HBO Go for $30 a month. A better deal than before, to be sure. And if we upgraded our internet speed to Extreme (one level higher than we have now), they have a package that makes HBO only $25 more expensive. An HBO standalone offering might cost that much. It seems strange that a package targeted at cord cutters holds back the TWC TV app… I can’t be the only one who views that as a non-starter.